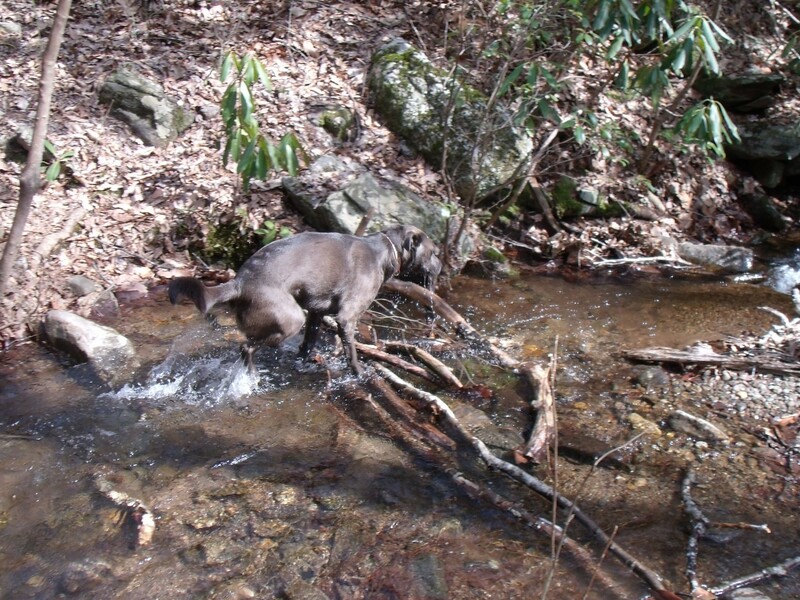 Thistle LOVES running through the creek–I suspect this is her tonic. It’s finally spring in the mountains of Western North Carolina. We had a mild winter, but it just wouldn’t go away. At long last we had a lovely weekend with highs near 70 and lots of sunshine. The kind of weather I wouldn’t mind having ninety percent of the time. Now it’s true that I take Thistle hiking in all sorts of weather. I’ve even slogged through the woods carrying an umbrella. (You have to watch the angle when passing through the rhododendron tunnels.) But THIS is the kind of weather that transforms a hike into a spring tonic. My great-grandmother would send Dad out to gather young mullein leaves each spring (it’s still a bit early for them here) when he was a boy. She dried them in the oven, then crumbled them. She smoked two pipes full–that was her spring tonic. I don’t know if she enjoyed it, or if it was more of a medicine, but it supposedly perked her up. I think most of us are in need of a spring tonic now and again. The idea is to invigorate and energize the body and soul–get the sap rising, so to speak. For me, a long walk in the woods on a gorgeous day with a little grey dog bounding joyfully ahead and a steadfast husband by my side is a most excellent tonic. So how about you? What’s your spring tonic? ← I Need Your Advice . . .
Love the idea of getting that sap rising! And mine was definitely being out in the sunlight, planting lots of seeds for my garden. I also love weeding and checking up on my flowers’ progress. Somehow the whole process relaxes me! Yay for spring weather! Oh, man! The Dairy Queen! I though getting a Peanut Buster Parfait was the height of decadence. Dairy King opened here 2 weeks ago and Jean mowed the grass yesterday. Do you remember fiddlehead fern salad? Yay! Hmmm. A Mother’s Day Dilly Bar? What fun! I was visiting my family this weekend in the Mills River area and took our dog on many lovely walks… Sunday am we were startled to see a pack of coyotes! Eeek! Oh, yikes! I’d ten times rather see a bear than a pack of coyotes. We hear them, but I’ve only seen a single here and there. Oh no, not another blizzard! Wishing you warm breezes . . . Mine is that first day, here in New Mexico, when the windows can be opened before dawn and the fresh ephemeral smell of the greening desert permeates the house. The first windows to be opened are in the former breakfast room – now the Pit Bull Bedroom & Day Spa. The Pits (nine of them) in their sleeping crates sit or lie quietly, sniffing the air, eyes half-closed. Nine?!? I didn’t know there were nine. Oh, that’s just part of them. We have more…we run a sanctuary for those with nowhere else to go. I’ve been thinking about this since you posted it. Tapping my chin, wondering, and I figured it out. Yes, I love my garden. But I also LOVE to get out my tools and start a new re-finishing project. I work either outside or in the garage, because the noise, fumes and dust don’t do well IN the house. And for the chemicals to work, it has to be 60 degrees or warmer. So, very soon, I can go for it!! You have NO idea how much I wish we lived closer to each other!